Photographers who have yearned for a full-frame digital SLR that won't break the bank - or their backs - just got their wish with the new compact Canon EOS 5D digital SLR which offers a full-frame CMOS sensor with 12.8 megapixels of resolution, available in October for an estimated selling price of $3,299*. As the world's smallest and lightest** full frame digital SLR, the EOS 5D model features Canon's proprietary DIGIC II Image Processor allows users to shoot up to 3 frames per second; record up to 60 full-resolution JPEGs and 17 RAW images in a single burst. The camera includes a new 9-point AF system with six supplemental AF points for fast and precise focusing and a new 2.5-inch LCD/TFT screen with 230,000 pixels that's viewable even at extreme angles. "The Canon EOS 5D digital SLR is the camera that will make quality-minded 35mm and medium format film shooters switch to digital once and for all," said Yukiaki Hashimoto, senior vice president and general manager of the consumer imaging group at Canon U.S.A., Inc., a subsidiary of Canon Inc. "Wedding and portrait photographers who need facial detail in their group shots require the large file sizes the EOS 5D model can provide. For landscape and nature photographers who want to enjoy the entire range of their wide angle lenses, the EOS 5D DSLR's full-frame sensor is a dream come true. And for those photographers who hesitate at carrying around EOS-1 Series heft, they will love the EOS 5D digital SLR's lightweight feel almost as much as their accountants - or spouses - will love the price." 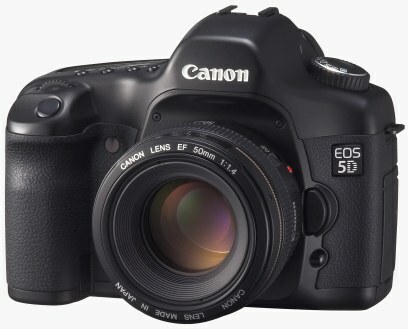 The heart of the Canon EOS 5D digital SLR is its extraordinary new, Canon-designed and manufactured CMOS image sensor. At 12.8 megapixels, there is enough resolution for a double-page spread in a magazine, a large print of the bride and groom, facial detail in group shots or a landscape of impressive dimensions. The sensor's 35.8 x 23.9mm size means that each pixel can be a generous 8.2um, resulting in exceptionally low shadow noise. The sensor's low power consumption extends battery life and lowers noise. A finer CMOS production process and optimized photodiode construction increase the light-sensitive area of each pixel and improve dynamic range as well. The full-size sensor maximizes the performance of Canon EF lenses, the world's largest selection of autofocus lenses. With the full-size sensor, EF lenses - even wide-angle lenses - have the same look and feel they have with conventional SLR cameras, preserving their optical signatures. Imaging quality in the EOS 5D is enhanced with the addition of the DIGIC II image processor, which provides detailed and natural color reproduction and fast image processing, including an incredible burst performance of 60 Large/Fine JPEGs or 17 RAW images at 3 fps. DIGIC II also enhances start-up time on the EOS 5D DSLR, bringing it down to a lightning fast 0.2 seconds. For users who do not want to bother with post processing, there is the Picture Style called Standard which produces images that look crisp and vivid with the sharpness set to mid-scale and the color tone and saturation set to obtain vivid colors. In the Portrait setting, the color tone and saturation are set to obtain nice skin tones with the sharpness set one step weaker than the Standard setting so the skin and hair look softer. Under the Landscape setting, the color tone and saturation are set to obtain deep blues and greens, the sharpness is set one step stronger than Standard so the outline of mountains, trees and buildings look more crisp. The Neutral setting is the same as the default setting for EOS-1 series cameras where natural color reproduction is obtained and no sharpness is applied. This is the ideal setting for post-processing. The Faithful setting is the same as Digital Photo Professional's Faithful, so when the subject is photographed under a color temperature of 5200K, the color is adjusted colorimetrically to match the subject's color with no sharpness applied. Monochrome is the same as the EOS 20D camera's monochrome setting and with User Defined, the user can create and save their own preferred settings. The camera body consists of a stainless steel chassis and a mirror box made of high-strength engineering plastic. Since the grip and front cover are one piece, body rigidity on the EOS 5D DSLR is excellent. The exterior surface is a high-density black satin finish with a leathery touch that feels smooth in the hands. The three grip surfaces are covered with rubber and the electroplated "EOS 5D" badge and recessed and painted Canon logo give a quality appearance to the camera. The EOS 5D model has a 2.5-inch polysilicon TFT LCD monitor with approximately 230,000 pixels. At 170 degrees, it has an exceptionally wide viewing angle. In contrast, picture brightness on older LCD screens was often lost if viewed from even a slight angle, so oftentimes image review involved a lot of guesswork. The new LCD on the EOS 5D model, however, maintains the same brightness from almost any viewing angle. Brightness on the monitor is also adjustable in five levels and the screen's backlight feature uses six LED modules, as opposed to three on previous models, to helps illuminate the 2.5-inch LCD evenly. Along with the larger monitor, the menu text is also larger and easier to red. The full-featured INFO screen includes files sizes, RGB histogram and AF frame displays. In addition, Quick Review images are now enlargeable. Because noise is difficult to see on a camera's LCD monitor, even one as large and detailed as the EOS 5D camera, it is hard to know whether noise reduction should be turned on or not. Thanks to a new automatic noise reduction feature on the EOS 5D DSLR, getting rid of unwanted noise has been made even easier that with previous models. In the C.Fn-02-1 setting, automatic noise reduction occurs when noise is detected for exposures of 1 second or longer, regardless of ISO. In the C.Fn-02.2 setting, full-time noise reduction for exposures of 1 second of longer occurs regardless of whether noise is detected and regardless of ISO. With these two options, photographers using the Canon EOS 5D DSLR can adjust the camera's noise reduction capabilities to suit a particular situation. The EOS 5D DSLR has a bevy of other high-end features including the same ISO range as the 1Ds Mark II - ISO 100-1600 in 1/3-step increments and ISO speed extended at L:50, H:3200. Also included on the camera is ultra-precise white balance with nine types of white balance settings, white balance bracketing (blue-amber and magenta-green, even on RAW and RAW+JPEG shots) and white balance correction. Other features include enhanced 35-zone exposure metering; spot metering in approximately 3.5 percent of the viewfinder area; six selectable JPEG recording modes including RAW and simultaneous RAW+JPEG; a large bright viewfinder with three interchangeable focusing screens; new flexible and convenient folder creation and selection; and more advanced PictBridge functions.